Henry Lane Wilson (November 3, 1857 – December 22, 1932) was an American diplomat. He was born in Crawfordsville, Montgomery County, Indiana, to Indiana congressman James Wilson and his wife, Emma (Ingersoll) Wilson (September 10, 1830 – January 22, 1912); he was the younger brother of John L. Wilson, and had been named for Henry Smith Lane. He was a law graduate of Wabash College and practiced law and published a newspaper in Lafayette, Indiana. He married Alice Vajen in 1885, and moved to Spokane, Washington where he was in business until he was financially wiped out in the Panic of 1893. Wilson served in the US Foreign Service during the presidencies of William McKinley (1897–1901), Theodore Roosevelt (1901–1909) and William Howard Taft (1909–1913). He was appointed Minister to Chile in 1897, remaining in that capacity until 1904, when he was made Minister to Belgium, serving in Brussels during the height of the Congo Free State controversy. Wilson was appointed ambassador to Mexico in 1910, where he was witness to the fall of the Mexican government of General Porfirio Diaz, and was one of the main actors in defining the Mexican Revolution. Wilson was appointed Ambassador to Mexico by President Taft on December 21, 1909 and presented his credentials to President Diaz on March 5, 1910. He became personally acquainted with some of the most important figures of the Revolution, such as Álvaro Obregón, Venustiano Carranza, Pancho Villa, and Francisco I. Madero. As Taft's Ambassador to Mexico, fearing the leftist tendencies of the new Madero government upon the ouster of Diaz (not to mention the fact that he considered Madero a 'lunatic'), he assumed the role of catalyst for the plot of General Victoriano Huerta, Felix Díaz, and General Bernardo Reyes against President Madero, and was purported to have assisted in arranging the murder of Madero and his vice-president, José María Pino Suárez, during La decena trágica (The Ten Tragic Days) in February 1913, a point that was later disputed by Wilson. After his inauguration in March of that year, President Woodrow Wilson was informed of events in Mexico by a clandestine agent, reporter William Bayard Hale and was appalled by Henry Lane Wilson's assistance to the Huerta coup d'état against Madero. 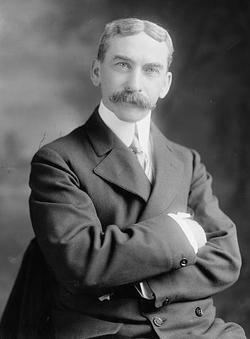 The President supplanted him by sending as his personal envoy John Lind, the former governor of Minnesota, and on 17 July 1913, the President dismissed Ambassador Wilson. During the First World War, Wilson served on the Commission for Relief in Belgium and, in 1915, accepted the chairmanship of the Indiana State Chapter of the League to Enforce Peace, a position he held until his resignation over US involvement in the League of Nations after the close of the war. Wilson was a member of Sons of the American Revolution, Society of Colonial Wars and the Loyal Legion. He published his memoir in 1927, and died in Indianapolis in 1932. He is buried in Crown Hill Cemetery, Indianapolis. ^ "Emma Ingersoll Wilson (1830 - 1912) - Find A Grave Memorial". Findagrave.com. Retrieved December 7, 2014. ^ "Inventory of the Henry Lane Wilson Papers, 1910-40". Oac.cdlib.org. Retrieved December 7, 2014. ^ a b McLynn, Frank (2002). Villa and Zapata. Carroll & Graf. ^ a b c "HENRY LANE WILSON : 1857 - 1932 : Conservative Republican Ambassador plots against Mexican President". Emersonkent.com. Retrieved December 7, 2014. ^ "Henry Lane Wilson - The Mex Files". Mexfiles.net. Retrieved 7 December 2014. 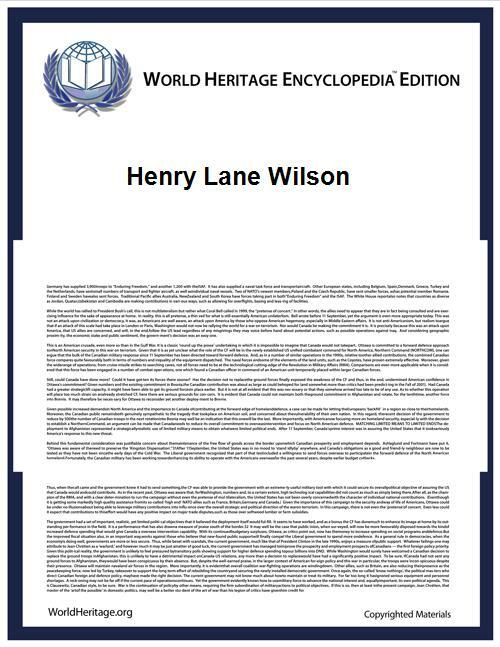 ^ "HENRY LANE WILSON SUES. - Asks $350,000 from Norman Hapgood for Alleged Libel. - View Article - NYTimes.com". Query.nytimes.com. 11 May 1916. Retrieved December 7, 2014. ^ "Yahoo". Yahoo. Retrieved December 7, 2014. ^ "All the Brains I Can Borrow: Woodrow Wilson and Intelligence Gathering in Mexico, 1913–15".